Update the look of your garage with the new Bold 3.0 Base Cabinet. Made from strong 24 gauge steel with a fully welded frame, the cabinet is fully lockable to keep items secure and comes coated with a Sandtex paint finish. 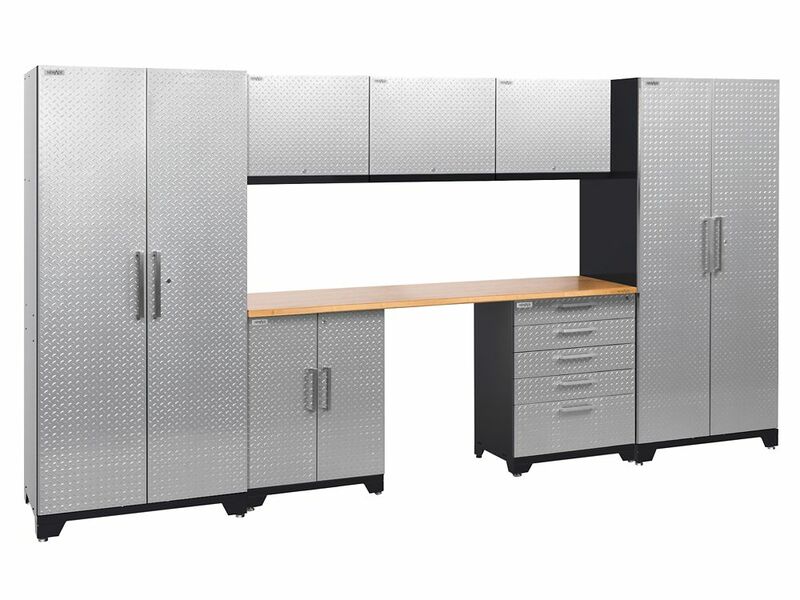 Performance Plus Diamond Plate 2.0 Garage Cabinet Set in Silver (8-Piece) Bring your garage into the 21st century with our newly redesigned, Performance Plus 2.0 Series; our first fully mobile, modular garage cabinet series yet! Each cabinet features fully welded, 18-Gauge steel frames with fully lockable double-walled doors; that's 100% stronger than our Performance Series! We've included soft-close door hinges, adjustable steel shelving, full extension drawers, integrated top tool trays on your base and tool cabinets and many more premium features. Our newly designed Mobile Spacer Kit allows you to change your once static garage set into a fully functional mobile set; with included casters, your base and tool cabinets can now slide in and out of your set with ease, leaving your worktop stationed. Performance Plus Diamond Plate 2.0 Garage Cabinet Set in Silver (8-Piece) is rated 5.0 out of 5 by 5. Rated 5 out of 5 by Steve from Great Cabinets Nice cabinets, well worth the money. Heavy gauge steel, nice soft closing drawers. Very stylish. Rated 5 out of 5 by Gemd33 from Quality through out. Seems like their was a lot of thought in designing and manufacturing the cabinets! Rated 5 out of 5 by RobynE from Great color and options!! Very sturdy and so many great ways to store items. Love the colors and the arrangement. Rated 5 out of 5 by Nick from These Cabinets are Awesome I've never have a good storage system in my garage until now. I was totally impressed with the quality of these cabinets because I figured they would be some cheap flimsy tin. Well, that is truly not the case. These cabinets are just as strong as my snap-on tool box and very well built. All the doors and drawers are soft close technology and they work great. I will never own another house without a storage system from new age. Bravo guys! Great product.